The GigaPan Dialogues seek to promote empathy and understanding between cultures and create a greater sense of community through an exchange of explorable, high-resolution digital imagery. Using a robotic camera provided by the programme, children in participating UNESCO Associated schools take explorable, high-resolution panoramic images of the world around them, and share them with their contemporaries around the globe. A group at one site of the globe posted an image, a group at the partner site explored it and left virtual "notes" with questions, and the first group responded. The sharing of their community’s sites, landmarks, events, and places of importance to them encourages self-reflection and a deeper understanding of community and self-identity. Students are challenged to think deeply about inclusion and diversity in their communities. They embark on a 21st-century community-networking journey to explore, document, and discuss the images and community identity. GigaPan itself is a robot combined with a digital camera (Point and Shot) that can take a picture / photo panorama automatically and through the help of software that is (GigaPan Stitcher) to produce a high resolution panoramic images such as images from Google Earth. GigaPan technology developed by Carnegie Mellon University in collaboration with NASA Ames Intelligent Robotics. GigaPan used by NASA for research and retrieval of data via high-resolution images. One use GigaPan by NASA's robot on Mars. In the world of education, GigaPan is often used by scientists from various universities in the world to produce an image / images with high resolution that can be used as documentation and research materials. By using GigaPan, students from schools participating in the project can take pictures / phenomena panorama of the world around them, and their share of the project through the website with other colleagues around the world so as to promote understanding, understanding between cultures, religions different and create a greater sense of empathy than students through curricular and pedagogical practices that incorporate the use of explorable, high-resolution digital imagery. GigaPan School Dialogue has been successfully implemented in South Africa, Trinidad & Tobago, and the United States in 2008. Because of that success, the program was pioneered development in Brazil and Indonesia. GigaPan can be used to cross subjects such as Biology, Physics, Chemistry, Geography, Sociology, Economics, and others. Then who is taking the picture? The students themselves who take panoramic pictures are of course accompanied by a tutor who constantly supervise and guide these students. The shooting process takes depends on vast panorama that will take. Once the pictures are finished in stitching then the software will upload the panorama images automatically to the website www.gigapan.org. Of course, the Internet connection is very influential here. The sooner it is done the sooner uploadnya. Our experience takes 1-3 hours in this process depends on the size of the size of the file that is uploaded. Then go to the website education.gigapan.org to start a dialogue. Approximately the dialogue that appears like this. 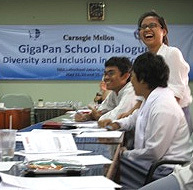 In addition to discussing the website, we also regularly hold discussions with fellow students GigaPan project participants Dialogue School in Indonesia. It also tighten the relationship and exchange ideas and share experiences on matters practices in the field.